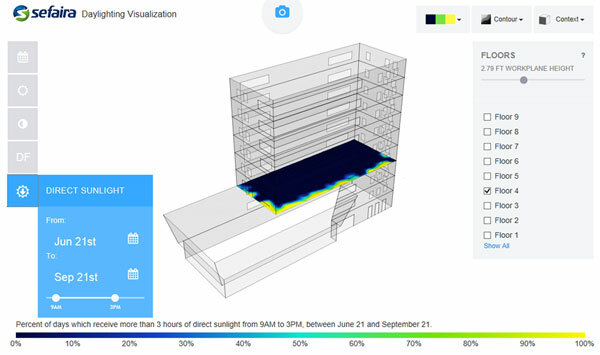 Building analysis software company Sefaira is developing a plug-in to assess and report on compliance with new SEPP 65 daylighting requirements, following 18 months of unprecedented growth. The company’s Asia Pacific director Josh Kates said the plug-in would also be useful for the tech firm’s global client base, if they also wanted to undertake a similar study on daylighting to achieve better building performance outcomes. Formerly a building engineer with WSP and Lincoln Scott, Mr Kates said SEPP 65 was a good mechanism for ensuring “really high quality residential buildings in Australia”. Where it can be challenging for designers, he said, was the weeks of manual calculations involved in assessing the degree of daylight for every living space. Sefaira Architects is a cloud-based tool that uses local weather files and the design inputs of the building envelope, surrounding context and shading to carry out the same calculations almost instantly and in real-time. It fully integrates with both Revit and Trimble SketchUp, and as designs are adjusted to improve daylighting and achieve compliance, the SEPP 65 modelling also automatically adjusts. Other capabilities of the platform include decisions around optimal shading and glazing ratios, thermal massing and natural ventilation. Sefaira originated as a joint effort between a New York-based programmer and a UK-based programmer in 2009, and has grown to about 500 subscribers and around 50 staff worldwide, Mr Kates said. It entered the Australian market at the start of 2014 with both an architects’ software product and an engineers’ software product, and has within 18 months gained around 100 subscribers in the Asia Pacific region, including Lendlease, BVN, Cox, Woods Bagot, Group GSA and GHD. The majority of staff are based in the UK or USA, and there are three Australian staff, comprising two engineers and a business development manager. The engineers’ software, Sefaira Systems, which was developed and launched following the success of the architect’s platform, has been used by some Australian subscribers for Section J compliance calculations, Mr Kates said. It delivers calculations including right-sizing mechanical systems, energy performance modelling and renewable energy modelling. “We’re making code compliance effortless so architects can focus on creating beautiful, high-performing buildings without getting caught up in spreadsheets and potentially repetitious, costly calculations,” Mr Kates said.